Wilson clearly has an impeccable style taste. Chicagoans face quite the choice this coming Tuesday. I am, of course, referring to our Mayoral election. Mayor Rahm Emanuel is currently running for a second term. Although it would seem like this should be a cakewalk for him (after all, none other than Barack Obama himself has endorsed him), Rahm’s term has been much rougher than many would have expected. Thanks to our Institute of Politics, four of the five candidates for Mayor have spoken to UChicago students. I was at three of those four, but before I offer my thoughts on the candidates, I want to address one of the biggest issues in this election: Emanuel’s decision to close the 50 worst-performing schools in Chicago. This was the largest school closure in American history, but what has happened in the months since these schools were closed? You wouldn’t know it if you listened to the Chicago Teacher’s Union, but an astonishing 93% of those students are now in better performing schools. To repeat, that’s 93%. Obviously these closing weren’t ideal, but the vast majority of students are now actually receiving a better education, despite what almost all of Emanuel’s opponents are saying. With that brief background in mind, I’ll go to my thoughts on the five candidates, starting with the three that I met. Fioretti was the first speaker to come to UChicago (and he was also the first candidate to announce his candidacy to challenge Rahm). I briefly wrote about him before, and how his presentation reminded me of Chris Christie’s debate with Barbara Buono, where he asked her if there’s a single tax hike she regretted. New taxes were his solution to just about every problem we faced. 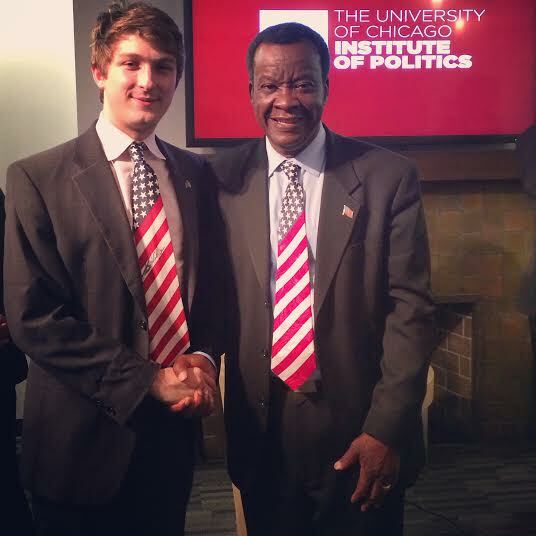 I asked him how he planned on working with Governor Bruce Rauner, if elected. As I recall, his answer didn’t consist of anything more than bashing Rauner (considering only one ward in Chicago went for Rauner just last November, that might not be an unwise strategy). 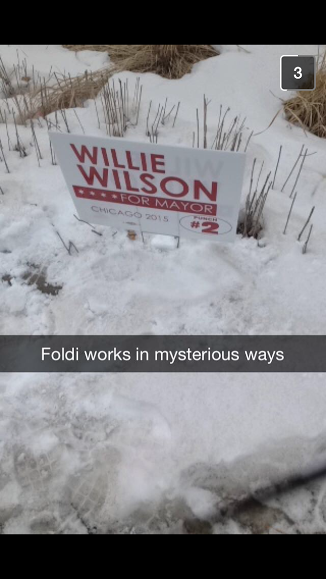 Like most of the candidates, Fioretti is running to Rahm’s left on most issues. That said, he does support the hiring of 500 new police officers, which earned him a critical question at his visit here. His was an interesting talk from a historical perspective, but he offered virtually no vision until he was pressed to do so at the end. That is not to say that he lacks vision, but none was shared with us. But while I’m writing about him, it’s worth sharing some of the things I learned about the history of Mayoral elections: Walls was one of the top aides to former Mayor Harold Washington in the 80s, and he views this election in a similar lens (maybe that explained why he spent such a significant amount of time on the past). In the election before Washington was elected Mayor, there was a televised Mayoral debate just a few weeks before the Democratic primary (back then, the primaries were partisan; in theory, the primary is now nonpartisan). His performance was so well-regarded that the race was fundamentally changed. He compared that to his performance in the debates in this cycle. Walls has run for Mayor and other elected offices quite a lot of times, so he has a lot of difficulty getting media attention. That is, until a recent debate, where his sharp elbows led to him now receiving minimal coverage. I asked him a question that naturally led from that logic: what was his moment of the cycle that he viewed as the tipping point? He said that similarly to Washington, these debates were his moment, however, when he asked the audience if anyone had seen the debates, precious few hands went up. His struggle is indicative of every candidate who is not Rahm, given the millions of dollars he has in his account. 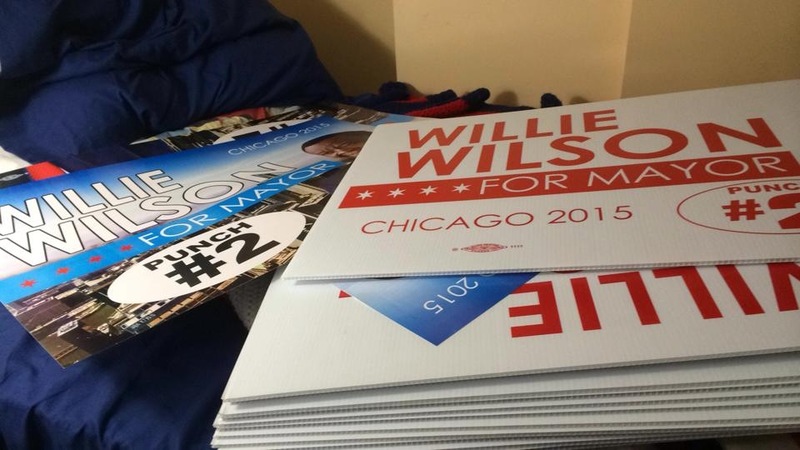 Although Wilson entered the race a mere seven weeks ago, he’s towards the front of the pack of candidates whose name is not Rahm. Although he only has a seventh grade education, he is an immensely successful businessman, who now gives every Social Security check he receives to charity. Last Sunday, Wilson met with the Cook County Republican Party. Although he obviously disagrees with them on many of the issues, he did endorse Bruce Rauner in the 2014 election. Wilson is probably the most pro-school choice candidate in the race (more on that later), and that is reason enough for me to spend part of Election Day in the cold handing out literature for him. I don’t know if I took enough literature. As a fun fact, after Wilson’s speech, I was interviewed on Public Affairs TV with Jeff Berkowitz (I’ll post the link once it’s up) about my thoughts on the race, which made me like him even more. My door’s newest decoration. The inside of my room is only slightly less clean, as anyone who has been inside can attest to. It’s almost impossible to be on UChicago’s campus and not know who Chuy Garcia is. He has an incredible presence on campus (two people in my house have his yard signs on their doors). However, my sense is that he has a ceiling of 20% max. That may or may not be enough to force Rahm into a runoff. I wasn’t at his talk here, but it was a couple of days before his support started swelling. 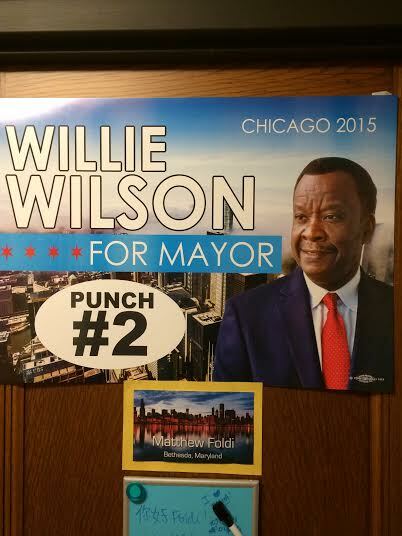 He has been endorsed by the Chicago Teachers Unions, which is enough to ensure that I’d never vote for him. 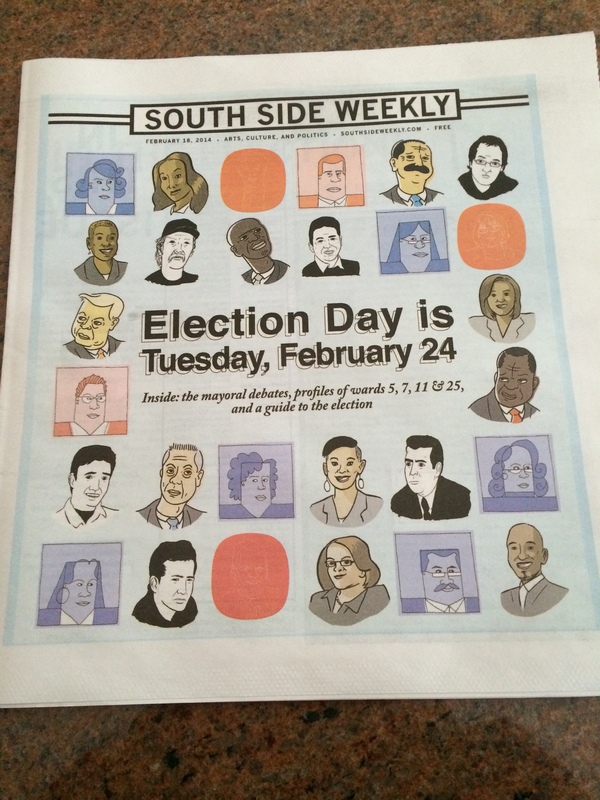 Rahm is, of course, the incumbent. He is also probably the most profane Mayor in America. For whatever reason, he didn’t make a trip to our campus to speak to us, and as such I don’t have any personal anecdotes to share here. However, there is a complete lack of any presence of a campaign in this area should probably concern him. It’s one thing for a minor candidate to have no presence in an area as heavily populated as ours, but an incumbent seemingly having no support isn’t a good sign. Rahm has shown during his time in office that he’s willing to enrage just about anyone, from teacher’s unions to religious leaders. Back in 2011, Emanuel changed the city policy of providing free water to schools and churches. Clearly the man is a character. What remains to be seen is if 50% of the city views that as a good thing (there’s a great profile of him here), because keep in mind, despite the tens of millions of dollars that Rahm has in his campaign coffers, he’s still only sitting at about 50% in the polls. So what does all of this mean? What’s going to happen on Tuesday? The odds are Rahm will win outright. This is good news because it will show other, similarly-minded Mayors that teachers unions can be challenged without fear of electoral defeat. There are two reasons I’m focusing so much on that: the first is that it’s a critically important issue (and also the only one you’ll see Ted Cruz standing side by side with Sheila Jackson Lee on) and because it’s one of the few issues I more or less agree with Rahm on. If Chuy comes in a solid second, that’s cause for concern for Rahm, but as I’ve said before, I don’t see him doing that well, even if he does force a runoff. The final possibility I can envision is Wilson coming in second. Although this seems farfetched, he has come extremely far in the past seven weeks, and if he’s peaking at just the right time, it’s a total possibility. I would rank those from most to least likely. A final thing to keep in mind is that this election is in the middle of February. It is freezing outside. I don’t think that turnout will be that exceptional (especially with a lack of a senate or gubernatorial election to help drive turnout). Getting this Snapchat made my day. We’ll know for sure what happened on Tuesday evening. That said, I won’t be shocked if we have four more years of Mayor Rahm. As you can see, there are quite a lot of elections that we have to look forward to hearing about on Tuesday.